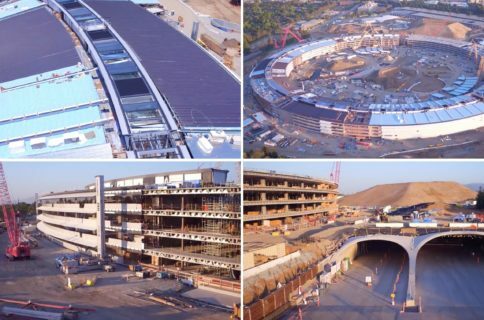 The iPhone maker’s upcoming circular-shaped corporate building, Apple Campus 2 aka “iSpaceship”, seems to be coming along nicely as the company pushes the project to meet its self-imposed January 2017 deadline for moving in. YouTubers Matthew Roberts and Duncan Sinfield have been taking their pricey drones to the skies every month, like clockwork, to keep us updated on construction progress with birds-eye 4K footage. The most recent drone video from Matthew focuses on landscaping work as other smaller structures are beginning to pop up throughout the campus, with landscaping on the corporate auditorium set to begin shortly. Here’s Matthew’s August 2016 construction update. The huge dirt pyramid is shrinking as landscaping begins. Cranes are lifting iron into place. A garden and a pond in the open ground in the center of the main circular building has begun taking shape. 100,000 sq ft corporate fitness center is progressing nicely, with basketball and tennis courts being built in front of the building. We can see foam blocks and parking garage tunnels being covered in dirt. Fuel cells and power generators will line the side of the garage (the whole iSpaceship complex will be entirely powered by renewable energy). All told, parking structures will encompass two million sq ft.
Security kiosk is taking shape. The main research and development center, a completely separate building, looks half-finished. We can see multiple smaller auxiliary buildings being built nearby that will be used for office space and research. North Tantau and visitor parking garage is visible. Work has begun on 2,500 sq ft maintenance facility. Solar panel frames are ready to be lifted into place, with more cranes on the site than ever before. As you can see for yourself, work on iSapceship’s exterior continues, with more progress being made concerning installing HVAC and solar panels on the roof. Duncan did not post his August 2016 video update yet, but when he does I’ll update the article with his video. In the meantime, check out his mid-July progress update below. “Construction in Cupertino really progressed last month,” Duncan said. 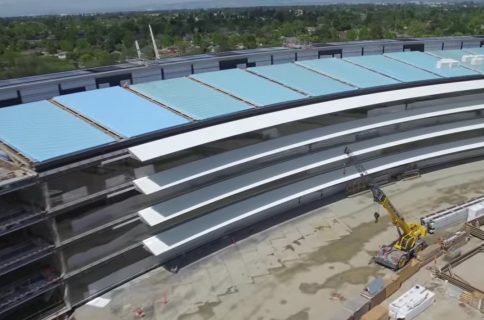 The landscaping in his video also shows signs of progress, bringing to mind Steve Jobs’s detailed descriptions regarding the number of trees they’d have on site. Specifically, Apple will add more than 7,000 trees spread across 300 species to the campus, including replicating some of the California landscape like sprawling orchards that was around when he was a child. For reference, here’s Steve Jobs presenting the project to the City of Cupertino City Council on June 11, 2011—his last public appearance before his death. Work on the 176-acre site began in 2014. The UFO-shaped building will use four-thousand pieces of curved glass and, when finished, will file as the largest office building in the world. 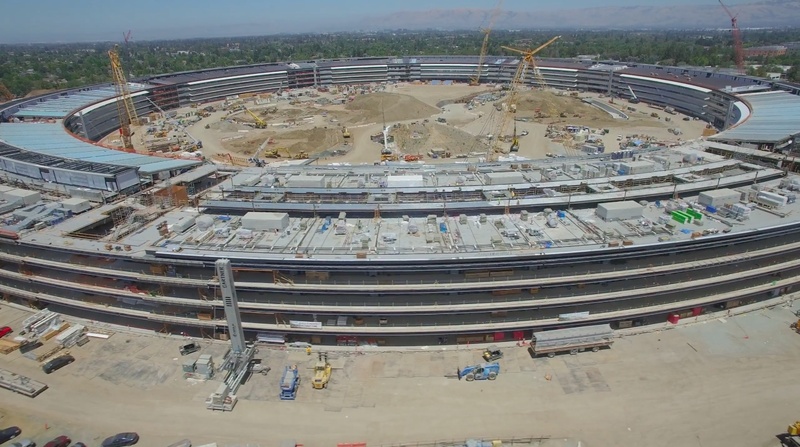 Apple anticipates moving in about 13,000 employees by early 2017. 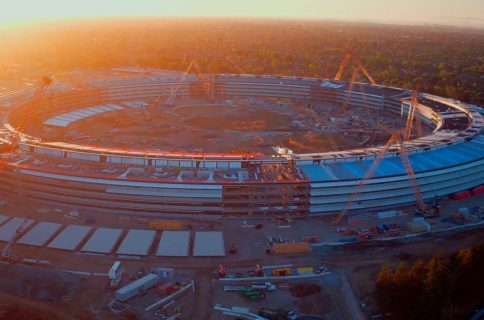 Barring any unforeseen circumstance, I plan on taking a trip to U.S. (I’m based in Europe) in January to visit Apple’s stunningly looking new campus.